Ellen grew up in Fairfield Connecticut, where she started studying ano, voice, and violin, focusing on violin in the studio of Denise Chividian. She earned a dual degree in Music and Cognitive Science at Vassar College, studying violin under Linda Quan and the late Betty-Jean Hagen, and voice with Robert Osborne and Drew Minter. At Vassar, she participated in multiple vocal and instrumental ensembles, and for two years led the early music orchestra, the Vassar Camerata, while studying conducting with Eduardo Navega. 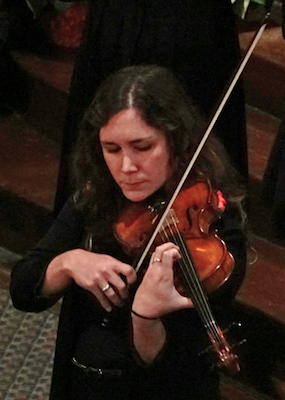 After graduation, Ellen moved to Boston to pursue a career in science, but was thrilled to be able to join Boston's vibrant musical community as part of the Brookline Symphony Orchestra, as well as the Boston Choral Ensemble. Ellen is now a PhD student in the Harvard-MIT Health Sciences and Technology program where she studies genetics and developmental neurobiology in a lab at Boston Children’s Hospital.